Desolation Canyon rafters hike down from the dirt runway to Sand Wash.
Desolation Canyon rafting trips on the Green River generally start at Sand Wash. Sand Wash is a dirt boat ramp about 100 miles North of Green River, Utah. The day before the trip starts our truck, crew, and gear drive from Green River, Utah to Sand Wash. Once at Sand Wash they rig the boats for the trip and prepare for the next morning when our guests arrive. 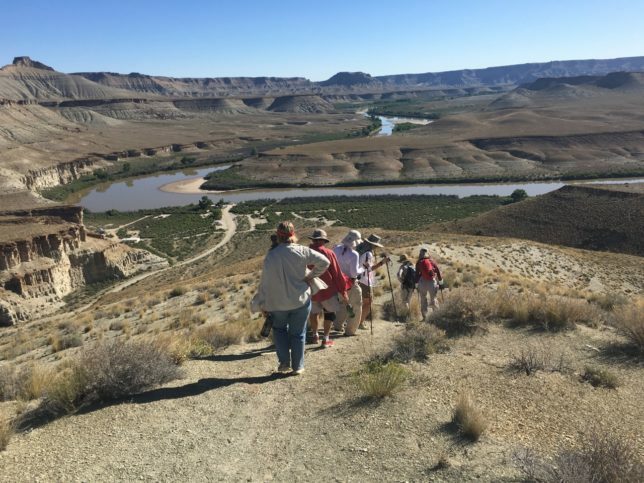 Our guests fly up the morning of the trip from Green River, Utah on small 4-6 person planes and land on a dirt runway on a mesa above the Green River. Once at the runway their gear is transferred from the plane to the truck and one of our guides leads a mile and a half hike down to the river. Anyone unable to walk that far hops in the truck and is taken with the gear down through the dry wash back to the rafts. Once at the river, gear is loaded, life jackets are fitted, and everyone is given an orientation about the environment and safety. Then its on to the river for 5 days and 4 nights on one of the most beautiful and fun stretches of river anywhere. 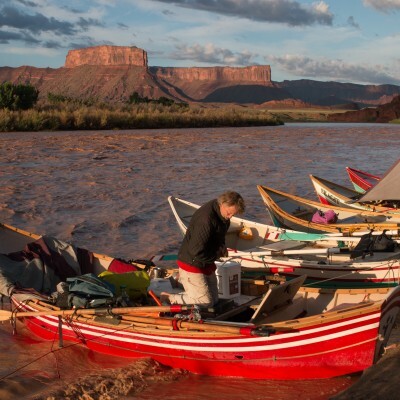 The Green River has always been a barrier for travel. 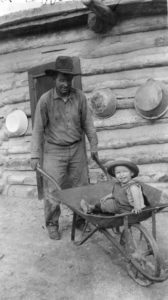 Early fur trappers and frontiersman had to ford the river or build boats out whatever they could find. Early in the 1900s it was still a major undertaking to build a bridge across a river the size of the Green. Henry “Hank” Stewart operated a ferry at what is now known as Sand Wah during the 1920s. 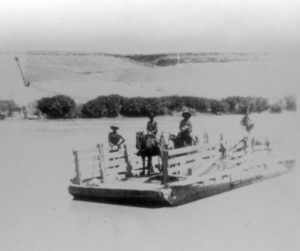 The ferry was mainly used to transport livestock between summer and winter ranges. Up to 45,000 sheep passed by Sand Wash each year. The ferry had a capacity of 50 sheep per trip. They were sheared across the river from Sand Wash to what is referred to as the “Wrinkles” side. The wool was then carried out by Wagon. In Stewart’s best year he made $2700 dollars form the ferry. 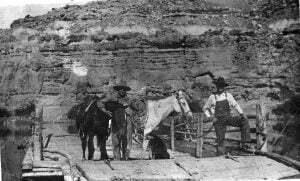 He charged 3 cents per sheep to use the ferry and one dollar per wagon.